The dark red rose decorates a little girl’s hand while the girl’s eyes dive into the rose’s flavor. Both, the girl and the dark red rose, form a meaningful unit of presence, awareness, being in touch with each other and thus creating reality. Of course one would say the little boy is not there. It is…………………… the imagination, the inner picture of the boy, the little girl is maybe in love with. Of course the boy is not there, it is only the little girl’s expectation embodied in the shadow. It is emotional resonance which can vanish within in a moment. But it’s the real boy who is brought up to life by admiring the dark red rose in the little girl’s hand. It is our imagination which supports this communicative birth. 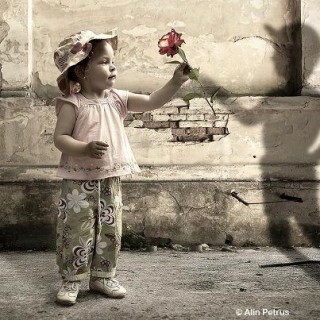 It is us who let the little girl, the shadow, the imagined boy and the rose communicate with each other. And of course with us. It is us who establish and structure a relationship which mirrors our own wishes, expectations, fear or longing. It is us who put nonverbally this scenario into words. Words which seem to speak to us. Words by which we communicate to the world and the other. All symbolized in this wonderful red rose.